Since her days as a journalist more than 10 years ago, Melissa has had a passion for Hip Hop en Español y Portugués. She has written on reggaeton, street literature, Mexican Hip Hop in New York, and Brazilian Hip Hop for numerous journals. She has also taught classes and delivered invited presentations across the country. Her dissertation, "A Mexican State of Mind: New York City and the New Borderlands of Culture,"
explores how hip hop culture functions as a response to forms of migrant containment for young Mexican men in New York City. 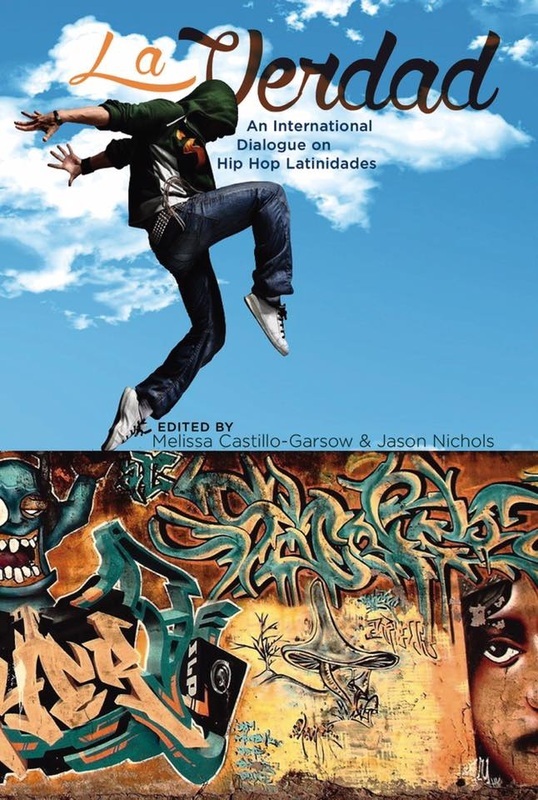 She is also co-editor with Jason Nichols, Phd, University of Maryland-College Park, of La Verdad: An International Dialogue on Hip Hop Latinidades, with Ohio State University Press (Available now!). It is the first volume to explore Hip Hop in Latin America. She has also served as guest editor of Words. Beats. Life: The Global Journal of Hip Hop Culture, the first peer-reviewed journal of Hip Hop, to present a special issue on Brazil in Fall 2016. Learn more about Melissa's journey to Hip Hop below. Growing up Mexican American in upstate New York and Mexico City, hip hop was not part of my culture. And while the sounds of 1990s gangsta wrap followed by the commercial rap of the 2000s played in the background, it was not a music that I identified with or sought out. When I moved to New York City in 2002 to study journalism at New York University, I was assaulted by a very different sound or music then the traditional Mexican music I grew up with, the mainly white rock that was popular in my small college town, or the hip hop I saw on MTV. The "Latin Alternative" music scene had arrived to New York. I began listening to artists like Manu Chao, Café Tacvba, Calle 13, The Beatnuts, Ana Tijoux, La Ley, Los Amigo Invisibles, Control Machete and many others. Although they reflected diverse countries, cultures and backgrounds, what drew me to them was the way they lyrically, sonically, and stylistically represented hybrid cultures and linguistic traditions with an urban feel. They didn't define themselves and didn’t feel the need to. Freelancing as a music journalist, before I could often legally gain entrance into these venues, I was able to meet, talk to, and most importantly listen to a diverse set of Latin American and Latino Artists. In particular, Yerba Buena was one of the first groups to really speak to me. Against the backdrop of a highly masculinized and sexualized reggaeton music that was popular amongst college Latinos, but often made me uncomfortable, Yerba Buena was decidedly different. Blending some of my favorite Latin music styles cumbia, salsa, rumba with music from the African diaspora and performed by a band of musicians from all over the world, they showed me a different side to hip hop. And I liked it. From there I worked backward listening and seeking out both Latin American acts that incorporated hip hop and rap en español, but still largely preferring international acts to those grown closer to home. In 2005 I studied in Belo Horizonte, Brazil for 6 months. I went to study Portuguese and was again surprised by what I found. A hip hop movement was in full swing and it was racially unconscious, unapologetically political and incredibly infectious. Largely ignored by the mainstream music industry, nevertheless, thousands of youth gathered in soccer arenas to listen to artists like Racionais MC, Rappin' Hood, Marcelo D2, and Sabotage who rapped about racial inequality, prison systems, and life in favelas. When I came back to the US, I noticed how articles about Brazilian hip hop kept referencing the country is a home for conscious rap, a scene very reminiscent of the genre's US origins. Nevertheless, while these experiences peaked my interest in US hip hop's history and older music, I never considered hip hop mine until I heard "La Verdad," by Mexican New York hip hop group Hispanos Causando Paniko (HCP) in 2010. It was that same year that legendary Mexican American Los Angeles hip hop artist Sick Jacken was visiting with members of New York based group HCP when he heard a beat he couldn’t resist. That very day Jacken would record a verse for HCP’s new song, “La Verdad.” A classic hip hop tale of survival and street life, “La Verdad” is significant because it represents both the history and future of Latino hip hop in the US. A member of Psycho Realm and frequent collaborator of Cypress Hill, Sick Jacken has been an important member of the West Coast hip hop scene since the early 90s. Hispanos Causando Paniko, composed of Mexican immigrants to the New York City who rap entirely in Spanish and market themselves mainly to Latin America, represent the new and international landscape for Latino hip hop. Blending lyrics about the Mexican community in Queens, immigration issues and daily struggles in the city, with a clean, classic New York sound, the music spoke to me in a different way. The backdrop of the now destroyed 5 Pointz and live Mexican migrants painting graffiti localized the hip hop expression into something I could both sonically and lyrically relate to. At a time when the Mexican community in New York though substantial, was largely invisible - even to me - HCP's music represent a statement a presence, I desperately needed. They demonstrated that there are different ways to be Mexican rapper, or to be Mexican and love hip hop other than Chicano Rap. It proved that there were more ways to be Latino in New York then Caribbean. It showed that Latino Hip Hop was a lot bigger and more complicated then we thought. As I saw academics and artists alike express surprise at HCP's swagger and background, I realized that we were at a new frontier for hip hop. Latinos (mostly Puerto Ricans) are amongst Hip Hop's pioneers, but hip hop has not only spread throughout Latin America creating new sounds and genres, but changes to the US Latino makeup was well as a long standing presence of hip hop in those home countries is also changing what is bring produced here. Co-Editor with Jason Nichols. La Verdad: An International Dialogue on Hip Hop Latinidads., Ohio State University Press Global Latino/a Studies Series, 2016. Guest Editor, “The Brazil Issue.” Words. Beats. Life: The Global Journal of Hip-Hop Culture. Fall 2016. “Somos Mujeres Somos Hip Hop”: Feminism and Hip Hop in Latin America. Routledge Companion to Gender and Sexuality in Latin America. Frederick Luis Aldama, editor. Routledge, 2018. “Yo Soy Hip Hop: Performing an Authentic Mexican Hip Hop in New York.” Words. Beats. Life: The Global Journal of Hip-Hop Culture. Vol. 6 (Spring 2015). “Representing the Streets: Space and Place in Urban Literature.” Magazine Americana. March 2012. "Authenticity and Ghetto Realism in Donald Goines' Inner City Hoodlum." Words. Beats. Life: The Global Journal of Hip Hop Culture. Vol 5.1 (2012). Derek Pardue, Ideologies of Marginality in Brazilian Hip Hop. New York: Palgrave MacMillan, 2008. 224 pp. Anthropological Quarterly. 84.3 (Summer 2011), 769-772. “A Mexican State of Mind: New York City and the New Borderlands of Culture.”University of California – Los Angeles (May 8, 2018). “A Mexican State of Mind: New York City and the New Borderlands of Culture.” Global American Studies Postdoctoral Fellow Presentations, Harvard University (Sept. 29, 2017). "​Mexican Radical Diaspora in NYC." Freedom School, Bronx Beer Hall (July 26, 2017). "Mexican Art Collectives in NYC. "Freedom School, Brooklyn NY (June 21, 2017). "Yo Soy Hip Hop": Transnationalism and Authenticity in Mexican New York." Seoul National University, Korea (Oct. 2, 2016). Teaching Assistant at Fordham University: (Aug. 2010-Dec. 2010 and Sept. 2013-Dec. 2013): Taught twice under Mark Naison, Director, African American Studies, the 300 level course in African American Studies, “From Rock and Roll to Hip Hop.” Responsibilities include teaching the class of more than 40 students while Dr. Naison was traveling (two classes each term), helping to organize guest lecturers, providing readings and music, meeting with students. Invited Lecturer to Syracuse University (Oct. 11, 2010): Taught class on Street Literature to SPA 600 “Literatura, iconos y cultura popular en América Latina.” Also gave public lecture on Brazilian Hip Hop. "Representing the Streets: An Introduction to Street Literature." Invited Lecture, Syracuse University, October 2010. American Studies Association Conference, Atlanta, GA (Nov. 8-11):Dejamos una huella: Claiming Space in a New York City Borderlands. American Culture Association/Popular Culture Association National, San Antonio, TX (April 20-24, 2011): "Not Chicano Rap: Mexican Hip Hop in New York." Association of Writers and Writing Programs National Conference, Washington DC (Feb. 2-5, 2011): "Creative Online": projects that explore the intersections between creative writing and new media. “OPINIÓN: Lo que no debe gustarte de las mujeres latinas en la television.” CNN México. Nov. 23, 2011. “What Not to Love about Latinos on TV.” CNN.com. Nov. 22, 2011. “Hip Hop latino en Estados Unidos” and “Entrevista con Pitbull.” Zona de Obras. Spring 2005 (Spain). “Latinos in Hip Hop to Reggaeton.” Latin Beat Magazine. March 2005 (Gardena, California). For the past year, reggaeton has bumped and ground its way to the forefront of Latin music. “Radio Mundial.” Latin Beat Magazine. February 2005, Gardena, California. It's tough to be a Latin Alternative act in New York. “Slug: Latin alternative music.” Latin Beat Magazine. December 2004 (Gardena, California). Luis Tamblay wins over one timid New York audience with the pulsating rock beats of a new kind of music created in the U.S.A., but with inspiration from Latin America. “The New Gen-Fusion.” iCarambaU Magazine. Nov./Dec. 2004 (New York, NY). With their eclectic blend of urban, alternative and Jewish culture, the Hip Hop Hoodios are re-inventing our notion of Latin music. “Radio Mundial: Latin Insurgence.” Underrated Magazine. Vol 2, Issue 4 (New York, NY).